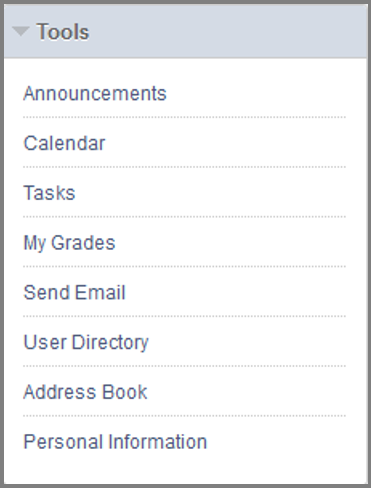 Login to your Blackboard Learn user account. Visit the My Institution tab and the Tools module. To view the contents of each tool just click on the respective link. Announcements Students are available to view important information concerning their course uploaded by their instructor. Blogs Effective means of sharing knowledge and materials created and collected by the group in the course. Calendar The calendar displays a collected view of all institution and personal events. Discussion Board May contain several forums created and managed by the instructor.Additionally, each forum may contain one or more conversations. Groups Your instructor can create a group, place you or allow you to select the group you want to join and provide a number of tools. Journals Personal space for you to communicate privately with your instructor. My Grades Page that shows the status and grade of all gradable items. Send Email Users within the group can email individual members or the entire group. Tasks Primarily used to keep track of work and remind you of important assignments that must be completed. It also shows the due date of the task. Wikis Collaboration tool that allows multiple users to read, edit and modify content added in a wiki page by the instructor or a fellow student.